Yeah but what you gonna do with those two extra Xeons? You cant just bolt them to the side of that two socket server. There is a huge price divide between 2 and 4 socket servers. Your numbers are totally disingenuous. You'd need to drop an extra 6 grand just to move into the 4 socket platform. You can see that right on HP's site. For $12,000 more you get 2 extra sockets, and all four chips get upgraded to 4850s. The upgrade is worth 4 grand. You also get a memory upgrade to 128GB. When you also subtract a couple grand for that 64GB of ram upgrade, you're left with 6 grand for the dual-to-quad socket upgrade. 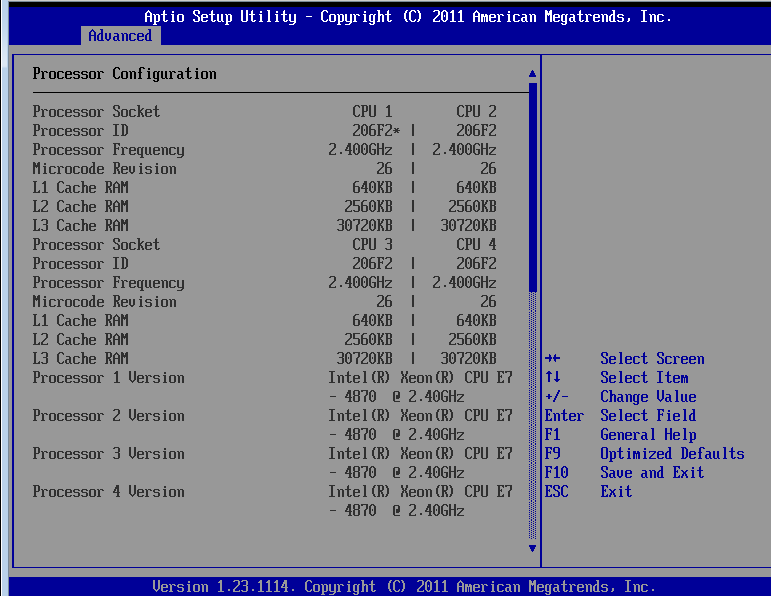 It only supports 32 DIMMs vs. 64 DIMMs, as another disadvantage. 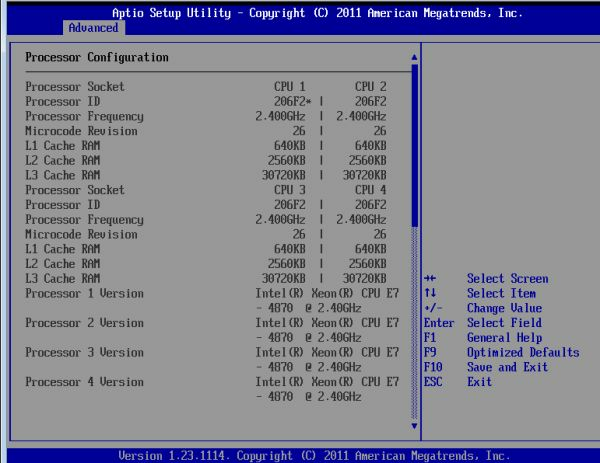 As L. points out below, the Intel setup is also using the E7-4830, which is 8 core instead of 10. And then the upgraded Intel setup with 10-core CPUs also bumps up to 128GB RAM and 4 x 1200W PSUs and ends up at $26819 (with 4 x E7-4850) -- note that the AMD setup already had 4 x 1200W PSUs. So once again, we're back to comparing apples and pears -- similar in many ways, but certainly not identical. And for that very reason, you can't even begin to make statements like L.'s "AMD wins on perf/watt/dollar" because we don't have any figures for how much power such an AMD setup actually consumes compared to the Intel setup. It might be more power than our review servers, or it might be less, but it will almost certainly be different. The processors listed here are e7-4830. Those processors are 8 cores (not 10 like 4870) and 2.13Ghz (not 2.4Ghz like 4870). Assuming linear scaling (although this is absolutely not the case) you would get the same perf/watt as the above model, and a total sap score of 52,518 vs 47,420 for the AMD 6174 (10% more). And the price is 18% more .. looks like perf/watt/dollar crown goes to AMD again. Other tests are clearly impossible to guesstimate and clearly the SAP test was where the e7 was getting a better advantage compared to vAPUs mark II test. 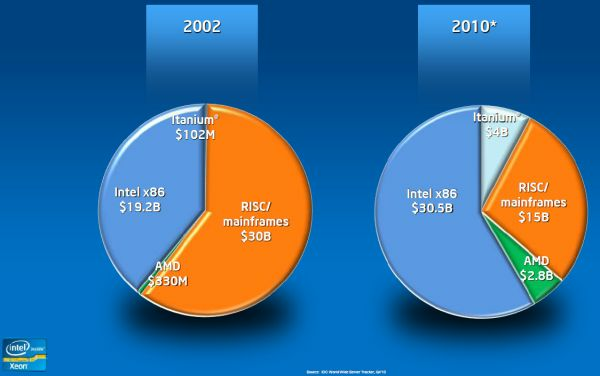 So yes, the argument stands that even though Intel has higher-priced extreme components, anything they have in AMD-performance-range is more expensive than AMD's option, quite logical with AMD as the underdog so far. What software does the average business need to run on a ridiculous number of cores? The only common application that comes to mind is internet facing Linux/Apache servers, and Linux/Apache are free(anyone dumb enough to pay for and use Windows/IIS deserves what they get). Then this really isn't for "most businesses", is it? This is Intel's new flagship. As such I do not expect it to be a good fit for many businesses out there. That does not make it any less interesting to review, since there are businesses that *can* make use of it. No, this is just another CPU that *could* be for most businesses, you could use it in the "lots of non-intensive apps running in VMs" scenario(or any other scenario), it's just an exceptionally poor value, and will probably not out-perform Magny-Cours or Bulldozer for most people's real world use. This CPU excels at benchmarking, and that's just about it. You know nothing about Enterprise level IT. Your Example of Internet Facing Apps and Linux Apache is the EXACT opposite design methodology of how things work in the real world. In the real world, internet apps run on the cheapest of the cheap servers and companies just use a ton of them behind a Load Balancer. Now the Database serving those web servers in the background, running Oracle RAC or MS SQL or even MySQL on the other hand will make use of all these cores and memory assuming you have a large database. The examples given RIGHT IN THE ARTICLE about things like SAP are probably the most common thing run on these Big Iron type boxes. If it helps prove my point any further, over at HP on the Sales side of things, the guys that have been selling RISC based machines under the HP Integrity/Superdome name for something like a decade, are now also being paid commission when they sell the DL580/DL980 G7 servers. Those 2 models use the Nehalem EX and will soon be using the Westmere EX.